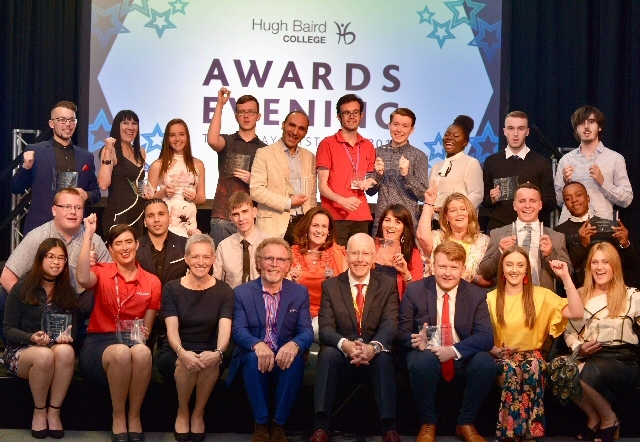 HUGH Baird College recently held their Student Awards Evening at the College's new South Sefton Campus in Litherland. The annual event celebrates the success of students, recognising them for their hard work and commitment. 25 students who have worked spectacularly hard throughout their journey's with the college were awarded for their continuous achievements. Award winners, their guests, college governors and staff were joined by this year's guest speaker Jeff Pearce. Jeff is a local entrepreneur who has had a roller-coaster career, overcoming a variety of challenges. He gave a motivational speech that highlighted the ups and downs of the business world, preparing students for their next steps after college. As well as presenting Student of the Year Awards for each curriculum area, there were 5 special awards announced. These included the likes of the Jim Brown Award for Personal development, which is named after 1 of the colleges previous governors and is always awarded to a student that has excelled inside and outside of college. This award was won by Adam Jackson who not only achieved a D*D*D* in his Level 3 Extended Diploma in Public Services, he was 1 of the 1st students to receive a prestigious promotion from Cadet to Lance Corporal in the College's Army Combined Cadet Force. Adam worked hard to multi-task his dedication to his course and the Cadet Force whilst volunteering as a Kayak and Water Sport Instructor also. The Taylor Prize is another prestigious award the college offers, which is awarded to a student who has overcome personal difficulties, achieved outstanding results and is progressing on to Higher Education. This award comes with a cash prize which is donated from a fund set up by Arthur and Joyce Taylor in recognition of the contributions to the Communities of Bootle and Sefton. The winner of this award was Samhilda McGonigle, who performed outstandingly well on her Level 3 Technical Diploma in Theatrical, Special Effects and Make up Artistry. After having a successful and exciting journey at Hugh Baird College, she successfully gained a place at Manchester University to continue her passion for Make Up Artistry. The evening also gave the college an opportunity to donate to Mr. Pearce's chosen charity MacMillan Cancer Support. The sum of ₤250 was donated to the charity on behalf of the staff and students of Hugh Baird College. Can you help Liverpool to Read Easy? FOR Donna, making dinner for her kids wasn't just tough; it was dangerous. Her eldest child has a peanut allergy and because Donna didn't know how to read, she was never sure that she was choosing ingredients that would keep her child safe. Donna had always found it difficult at School and had little support to help make sure she was really learning, so she fell behind. Years later, it was her children's belief in her that finally spurred Donna to make a change. The answer was 'Read Easy,' a free, friendly, flexible approach to learning to read which uses a successful phonics based learning scheme. It gives people the opportunity to work in private and at their own pace to build reading skills, confidence and self esteem. Read Easy is now poised to expand into Merseyside, beginning with a group for the City of Liverpool. With their sights set on the City, they are launching a search for 2 motivated volunteer:- 'Pioneers' with the enthusiasm and local connections to found a group for our City. Read Easy's Chief Executive, Ginny Williams-Ellis, said:- "Liverpool has thriving adult learning provision and a commitment to working in partnership, so it was a natural choice for our 1st Merseyside group. With 26 groups now across the country, we know that Read Easy can be life changing for learners and volunteers; the potential Liverpool Pioneer will gain satisfaction from knowing they will make the difference for local learners like Donna." Read Easy is enthusiastically supported by local partners from Liverpool Adult Learning. Jan Bibby, Employment and Skills Pathway Manager believes the project builds on their commitment for accessible and free learning opportunities. She expanded by saying:- "Read Easy will help us to reach even more learners within the City, to enable more of our residents to reach their goals in life and employment. We are collaborative by nature, and so Read Easy is a natural fit;- we can't wait for the group to get started." Liverpool City Council Deputy Mayor and Cabinet Member for Business, Economy and Skills, Cllr Gary Millar said:- "Liverpool City Council has a fantastic programme of Adult Education courses. Each year thousands of people in our City take advantage of the many learning experiences we offer. Not only do the courses boost people's skills but they are great for raising confidence and self esteem. Read Easy is a great addition to our programme. Taking part in an adult education course can lead to qualifications and possibly even a new direction in life. If you ever wanted to give something new a go, get in touch now and see where an Adult Education course might lead you." If you would be interested in finding out more about becoming a Volunteer Pioneer in the City of Liverpool or would like to know more about the project, please contact the North West Regional Adviser Vicky on:- 07931 138350 or send an email to:- Vicky@ReadEasy.Org.UK. You can find out more about the work of Read Easy on their website.